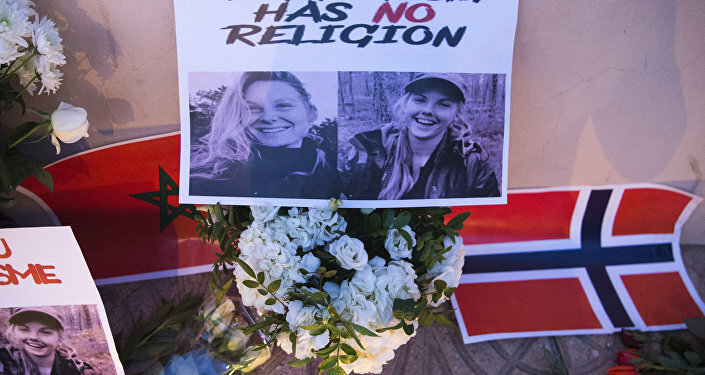 Last Monday, two female hikers — 28-year-old Maren Ueland from Norway and 24-year-old Louisa Vesterager Jespersen from Denmark — were found dead in the Moroccan mountains with signs of an atrocious murder. At the moment, no group has claimed responsibility for the killing. However, Moroccan authorities, along with the Norwegian National Criminal Investigation Service (NCIS), reported that the murder has been linked to radical Islamists who swore allegiance to Daesh*. In an interview with Sputnik, political commentator Nick Griffin, who also represented North West England as a member of the European Parliament (MEP) from 2009 to 2014, specifically pointed to Morocco's closeness to "Islamist-infested Algeria, whose own border with Libya — a failed state thanks to British, French and American intervention — makes it a hotbed for Salafist terrorism". "This makes it inevitable that Morocco is very vulnerable to terror attacks", Griffin noted, adding that "tourist areas make attractive targets for Islamist radicals seeking to cause economic damage in the hope of benefiting from the long-term radicalisation of Muslim youngsters in the areas". 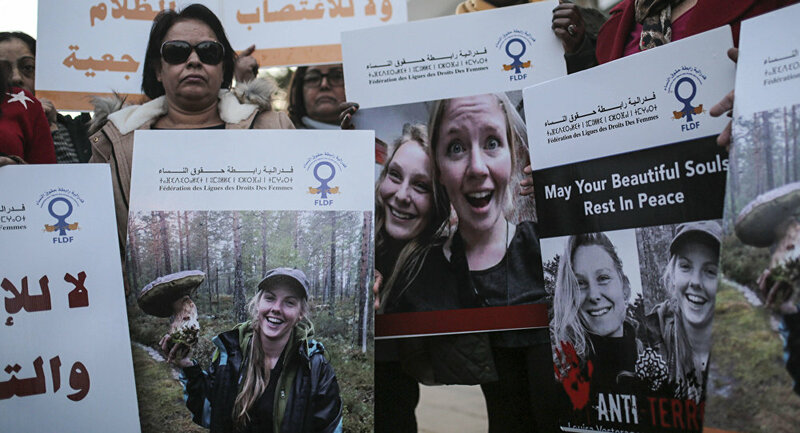 According to him, the killing of the two Scandinavian tourists will almost certainly ride roughshod over Morocco's tourism sector. "The cold-blooded and targeted slaughter of two innocent tourists is bound to have an immediate and massive impact on tourism bookings to Morocco. […] Every 10% fall in tourism to Morocco knocks 1% of the country's entire GDP, so the vulnerability is all too clear", Griffin pointed out. He suggested that the tourists' murder "unlikely to alter the behaviour of Norway, Denmark or other EU states towards Morocco although inevitably their Foreign Offices will increase the severity of their warnings to potential tourists". Griffin urged Moroccan authorities to turn to the governments of the UK and France and say that it is they who have sponsored "this Salafist menace" used against former Libyan leader Muammar Gaddafi and current Syrian President Bashar Assad. According to Griffin, Rabat should also tell London and Paris that "the blood of those poor girls is on your hands as well as those of the terrorists themselves" and that "it would be far better if you would simply admit your mistake and stop interfering in other peoples' countries and business". Griffin expressed regret that the Moroccan government's "innate conservatism" would prevent it from saying "such home-truths", predicting that "many more innocents will suffer before the Islamist terror unleashed by the usual globalist suspects is beaten for good". When asked how the tourists' murder will affect the development of tourism in Morocco, Safaa Kasraoui, a journalist at Morocco World News, in turn, pointed out that this "heinous and horrific act" will not have a "negative impact on Morocco's tourism sector or on its reputation as a safe country". Kasraoui also ruled out possible tension between Morocco, Denmark, and Norway over the tourists' killing because "the Moroccan state cannot be blamed for what happened". A total of 19 people have already been arrested following the murder of the two Scandinavian tourists in Morocco's Atlas Mountains. These include four main suspects and 15 others accused of having connections with the alleged killers. The police labelled the main suspects "lone wolves", despite their oath of allegiance to Daesh. The views and opinions expressed in this article are those of the speakers and do not necessarily reflect those of Sputnik.